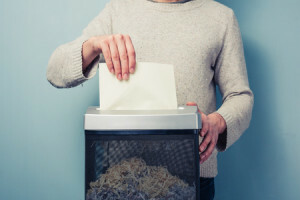 Shred documents before they end up in the trash. Keep a shredder handy to safely dispose of personal information such as credit and bank card statements or credit card receipts. Carry as little information as possible with you. Do you really need to carry five credit cards in your purse or wallet? Above all, avoid carrying your Social Security card and passport in your purse. Don’t write a lot of checks? Re-evaluate whether you should carry your checkbook everywhere you go. Limit the amount of personal information you provide. Avoid giving out personal information unless you have initiated the call or you are absolutely sure you know who you are dealing with. Does your gym really need your Social Security number? Proceed with caution when shopping online. Before submitting personal or financial information through a website, check for the locked padlock image on your browser’s status bar. Look for “https://” (rather than “http://”) in your browser window. This can help you determine whether you’re using an authenticated website. Keep close tabs on your accounts. Carefully monitor your bank and credit card statements each month to make sure all transactions are accurate. With online access, you can check your accounts as often as you wish! If you suspect a problem, contact your credit card company or bank immediately.